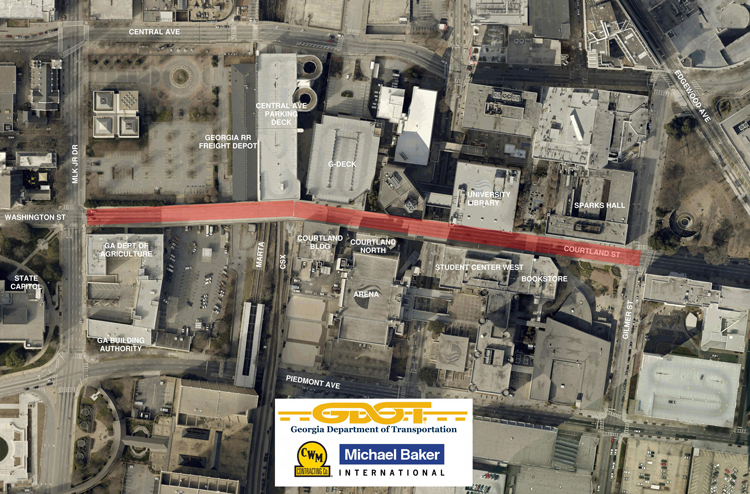 Norcross, Ga. — The Georgia Department of Transportation (GDOT) selected Michael Baker International to lead the engineering design efforts for the Courtland Street Accelerated Bridge Construction (ABC) project in Atlanta. The firm was awarded the $1.5 million Design-Build contract last year and will use ABC technology to coordinate the replacement of the bridge, which will improve safety and accessibility, while prioritizing an accelerated schedule. The 110-year old, high-profile Courtland Street Bridge, which provides access to the Capitol building and is a key pedestrian corridor for the Georgia State University campus, has shown signs of deterioration over the last several years. GDOT challenged the Design-Build team to replace the structure using an innovative solution that will reduce construction time and minimize major impact to the surrounding area, businesses and traveling public. The new bridge will replace all 28 spans of the Courtland Street Bridge over the Metropolitan Atlanta Rapid Transit Authority (MARTA) rail lines, CSX rail lines and Decatur Street. It will include 12-foot lanes that are better suited to safely accommodate increased traffic volumes and heavier vehicles. Michael Baker is working with CW Matthews to complete the project using the innovative ABC approach. This will cut the total construction time in half by using a phased design. The approach allows construction in certain areas to begin while design is finalized for the rest of the structure. This includes a foundation, beam, substructure and final overall bridge phase packages. During construction, the foundation will be installed underneath the existing bridge to reduce detours for vehicles and pedestrians. The ABC solution will also include protected access and exit areas through the work zone to key GSU buildings, accelerated concrete mixes and precast concrete beams for fast completion of bridge superstructure. Throughout construction, GDOT and the Design-Build team will proactively communicate with the public and ensure that stakeholders are informed, educated and engaged on the progress of the project and status of road closures and alternate routes. Bridge design began in late 2017, and Michael Baker provided the foundation’s package to the contractor three weeks ahead of the December 2017 deadline. Foundation installation will occur throughout Winter/Spring 2018, including a 180-day roadway closure in May. Construction is scheduled to be completed by late October 2018.